Does Beer Actually Help In Dissolving Kidney Stones? Kidneys are the most important organ of human body. They filter our blood and remove the chemical waste products, excess water present and then produce urine. Due to dehydration in the body, sometimes our urine gets concentrated, which certainly leads to accumulation of mineral & salt which consequently results in the formation of a small crystal. Ultimately these small crystals together form a large mass which is called as a kidney stone. The actual reason behind kidney stone is unknown. Almost all the stones are made up of calcium phosphate and calcium oxalate and there is no proper medication or cure to dissolve these stones. These small stones can be managed through various homecare processes whereas the large stones can be cured through ureteroscopy and lithotripsy surgery. The patients are suggested a common advice to prevent these stones and that is drinking much liquid. Body hydration works as an important part to cure your kidney and it is a necessity for the patient to consume liquid in pretty large volumes. As per a report, it was found that consumption of a moderate amount of beer is quite helpful for getting rid of the kidney stone, but on the contrary, there are conflicting reports also. Hence, there are two types of thoughts regarding the use of beer. Being an alcohol, beer is an antioxidant and a diuretic. 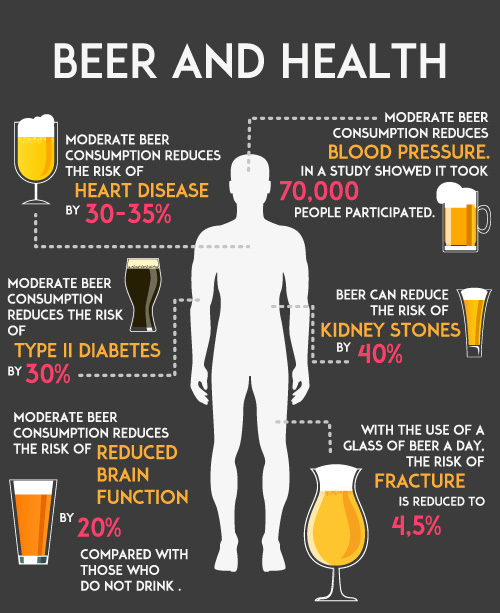 As per a previous study, beer intake can decrease the danger of kidney stones by almost 41%. As a diuretic, beer develops the volume of liquid in the patient’s body & forces the kidney to pass it in the urine. Hence, some amount of beer can reduce the undergoing pain risk while passing the kidney stone & can expel small sized kidney stones. From another study, it was observed that when you drink beer it dilates your urinary tract that helps the stones to pass away easily. However, there are few reports that are not in the favor of using beer for the treatment of kidney stone issues. It was examined that people suffering from chronic kidney stones try to drink beer in an excessive amount so as to drain out the stones. But on the contrary, it worsens the problem of stone formation. Being a diuretic, beer causes people to expel much of urine which makes the body dehydrated, as a result, urine gets concentrated. An excessive amount of drinking beer for a longer period can increase the amount of acidic oxalate in urine, which lastly has an effect of formation of stone in the kidney. In addition to this, it can also inflame gastroesophageal reflux. Beer contains gastric acid secretion due to which its higher intake can cause heartburn. From a report, it was discovered in few cases that consumption of moderate quantities of good quality beer can be helpful in resolving kidney stone problems. But its excess consumption is harmful in the case of prolonged kidney stone. Drinking enough water on a daily basis will be quite helpful for the treatment of kidney stones. Proper diet with low protein, nitrogen, & sodium will be helpful in curing kidney stone. Proper intake of lemon water, horse gram, pineapple and orange juice is also beneficial for the patients. Lemon is a rich source of Vitamin C and hence drinking lemon water on an everyday basis will keep the kidney stones away. Also, lemon appreciates the level of citrate in your urine which prevents the stone to form in the human body. Barley water is also a better option to prevent kidney stones as it creates bladder pressure and eliminate the formation of kidney stone. Good article! It should be noted that the only stones that can be “dissolved” are uric acid stones which account for 10% of stone. The vast majority of us “stoners” suffer from calcium oxalate stones that couldn’t be broken up with a hammer. People will often comment that they took some pill or drank something and it dissolved the stone. That’s impossible and what most likely happened is that you passed the stone. People don’t start on remedies until the pain arises. Any hydration will help push the small stone forward. That is an interesting part that beer dilates your urinary tract. Once you get one, you’ll most likely get another (75% chance) so drinking alcohol is not a great tool to prevent them but may help with passing them. Check out KSPtabs for helping combat future ones. They help you stay hydrated and the minerals bind with the calcium and oxalates so they don’t stick to each other.